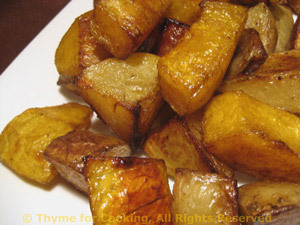 Roast Butternut Squash and Potatoes, Thyme for Cooking healthy gourmet sides. Cut the squash into large bite-size chunks (1 X .5 X .5", 2.5 X 1 X 1 cm). Slice potatoes in half the long way, then in half again; then slice in half or thirds the short way. Mix salt, oil and vinegar in a bowl. Add squash, potatoes, and toss well to coat. Spread vegetables on a baking sheet and roast for 30 minutes, 400F (200C). Note: To clean butternut squash first peel it, using a potato/vegetable peeler. If it's large (typically) cut it in half between the 'neck' and 'bowl' ends. Then cut those in half the 'long' way. Scoop the seeds out of the round end and discard. I use the neck end for uniform pieces and the bowl end for chunks and smaller pieces.